50 people were kind enough to fill out our survey from last week and here are the results. No real surprises there. The female participants were the first to fill out our survey. 2. What is your age range? Other countries included New Zealand and Argentina. 4. In the gaming world, what do you consider yourself to be? 5. If we expanded our range what would you like to see? More sci-fi space-shippy stuff is what you want. You also have a healthy interest in other genres with suggestions that included horror, fantasy, western, alternative skins for the pods and 15mm scenery. 6. What games system are you planning on using with our current product line? The majority of you want to use our pods for future war systems such as Firefight 2.0, Frag, Star Grunt, Kryomek, Tomorrow’s war, Dark Heresey, Sedition Wars, Warmachine, Dark Potential, Necromunda and Traveller as well as the usual suspects, Warhammer 40K, Infinity, Mercs, War Path and Star Wars. You also intend to use our pods for some completely different games systems including 7TV, Empire of the Dead, Dungeons and Dragons, Flying Lead, Vortex and Warhammer Fantasy as well as your own home made systems. 7. And finally – where did you hear about us? 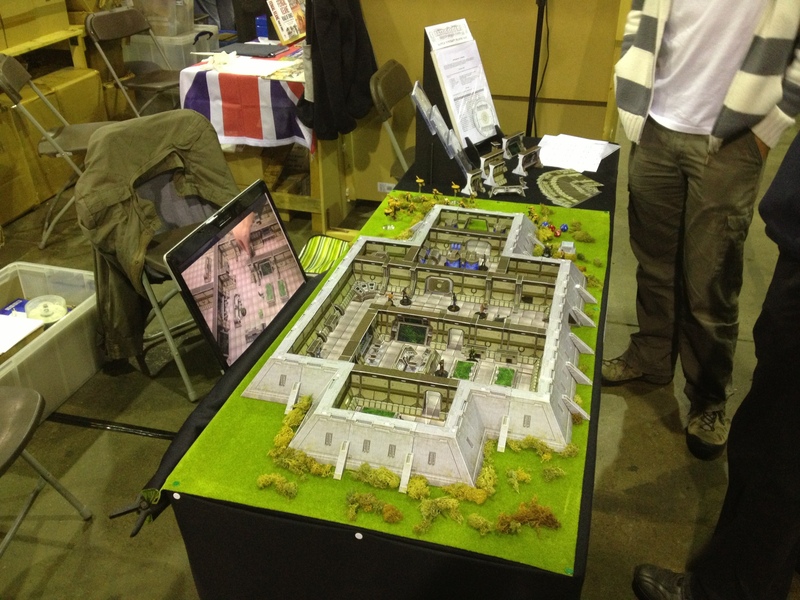 The forums and the internet were where most of you found us but plenty of people met us in person at the Derby World Wargames. Facebook, Twitter and Yahoo Groups dragged in a few more punters. This was our first show as Battle Systems and we weren’t too sure if it was right for us as it was primarily an historic wargames venue and we’re very much sci-fi. However, the response was tremendous and the crowds were very supportive and the organisers helpful and friendly. Opposite us were Mantic Games who were very positive about our display and to our right were Malifaux playing demo games. The vibe was positive and hummed with good natured geekiness. We had a great time. Our small but perfectly formed setup stirred a lot of interest. The venue was in a spacious warehouse known as Castle Donington International Exhibition Centre next to the Donington race track (in fact you could hear the cars zooming around outside making it sound like an arcade from my youth) with a footfall of over 4000 (possibly). Nearly half the hall was tournament games and the rest was packed with historic wargaming merchandise, demo displays, historical dress and a fair amount of fantasy and future war stuff. Overall, it was a good first outing for us, not too large but large enough to get some networking done, talk to a lot of people and make a healthy number of sales. We’ll definitely come back next year and are considering the Birmingham UK Games Expo in May, Hammerhead 2013 in February and of course Salute in April. Feel free to let us know of any other events in 2013. What? This one over here? Hello. Wayne at Battle Systems here. Our web page isn’t really setup for extended witterings and our Facebook page is more for quick hit information and Twitter, well, it’s hard to be verbose in 140 words or less.